In 2016, 399,225 complaints were filed with the FTC about identity theft. That’s equivalent to about half the population of South Dakota having their identities stolen. And that’s only complaints, aka, people who decided to contact the FTC about identity theft issues. Can you imagine what the number of people is per year who have their identities stolen? Companies can guess all they want on this number, but the reality is that we can’t truly determine how many victims there were because many people don’t realize their identity has been stolen until years later. What is identity theft? As defined by Merriam Webster, identity theft is the illegal use of someone’s personal information (such as a Social Security number) especially in order to obtain money or credit. We asked our community for identity theft case examples, and unfortunately, we got plenty of horrifying stories in return. Below are some recent identity theft stories from real people. Back in 2011 when I was an independent IT contractor, I used a credit card to buy equipment for customers. And then a supplier called and told me the card was denied. I called US Bank and spent more than an hour on the phone with the Fraud department. Kim was great. Since I’m an IT Security professional, I wanted my attackers to learn they’d picked on the wrong victim. Kim and I chased down every attempted fraudulent transaction. We even talked to one of the sales clerks, who had an address in Florida for one of the attackers. Kim and US Bank were great. They did everything right, including denying more than $14k in attempted fraudulent transactions and helping me chase down all the transactions. I wish I could say the same for law enforcement. I got a call from my credit card company asking me if I recognized a particular transaction. At first it almost fooled me because there was a list of valid transactions before one that I clearly didn’t make. They also were able to tell that the card had been used at a Walmart in Florida. They issued me a new card, cancelled the charges, and I went about my way updating all my stored cards online. Shortly thereafter, I get another call from my CC company, and I’m thinking “no way – I’ve barely used the card!” But this time it was for my business card. I asked them how this happens and they said one way is that criminals install card skimmers in P.O.S. terminals (where you swipe your card when you checkout). They only need it installed for a short while, are able to grab all the cards that are swiped, and then typically they make off with several thousand dollars. So it occurred to me that, given the short amount of time between incidents, I could cross-reference my two credit card statements and see if there was a common merchant. There indeed was – a local sandwich shop. I called them and told them to check out their terminal. The manager wasn’t very helpful but maybe it helped identify the issue and prevent other people from getting scammed. At any rate, since then my cards have occasionally been compromised. I’m not sure if it’s ID fraud, but I definitely got scammed. My husband and I normally only use our joint debit card for gas. It turns out that when you pay at the pump there can be card readers that make a carbon copy of your magnetic strip which they can then put onto a gift card or other “fake” card and use at a local ATM. This happened to my husband. He bought gas with our joint debit card and they next thing we knew, someone in Alexandria, VA withdrew all of the cash from our our joint checking account (perhaps they guessed the pin or maybe that data was also lifted by the card reader?). Then they tried to use our stolen information at a UPS store for a money order but thankfully that got declined. I called the bank right away when I got an alert from the bank that our checking was below the limit. They refunded us the money the next day and did a few weeks of “investigation” to make sure we weren’t making the story up (my husband had the card in his possession so the card itself wasn’t stolen or used). We changed passwords and pins and learned the hard way never to use debit cards or pay at the pump with a card! – Sadie C., Washington D.C. Pro Tip: To help prevent your PayPal account from being hacked, implement 2 factor authentication, which is like having a second password to your PayPal account that changes every 30ish seconds. If you want to hear some more identity theft stories, check out this Buzzfeed video. As you can see from these identity theft examples, your identity can be stolen in many different ways, and it doesn’t always have to be a stranger that’s the culprit. These identity theft stories are a reminder how important it is to take steps to prevent id theft. The good news is we have a comprehensive comparison of id theft protection services that you can checkout now to start protecting your identity. Learn more about why it happens and what to do if you have it happen to you in the infographic below. Do You Have an ID Theft Story? As you can see, identity theft can be a harrowing experience. Have you had any scares, even if everything turned out okay? Share them with us in the comments below, we’d love to hear from you. And who knows, maybe your story will help someone else fall into the same trap. It doesn’t matter how small or big your id theft scare was, a common one such as having a fraudulent charge on your credit card is sometimes the beginnings of a larger problem. Learn how to report identity theft and stop the leak of your personal information before it’s too late. 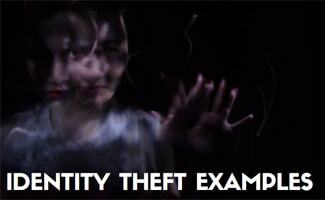 Curious about how widespread a problem identity theft is? It’s currently the number one consumer complaint to the FTC. And did you know there’s 19 new victims every minute? Check out our identity theft statistics article for more on who and what is most vulnerable, as well as some insight into areas of id theft you may not have anticipated (medical id theft, for example, is on the rise). Have you ever suffered from ID theft?